Home Grown Fun | Homemade Fossils – MADE EASY! It’s easy to “mix up some mesozoic” at home or at school! Making homemade fossils is fun and addictive. 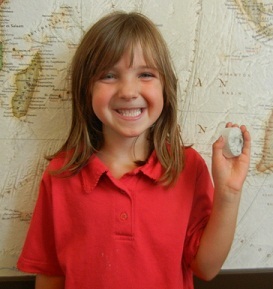 We’ve got a simple recipe for creating rock-like relics sure to bring out the Paleontologist in everyone! Below you’ll find our cute video with basic instructions plus a list of materials and extra tips for success. Also lower down the page get details on how to prepare for a group event and suggestions for teaching about fossils in an exciting way! PLASTER OF PARIS – One 4.5 lb. box per 125 students – approximately $5.00. LITTLE PLASTIC CREATURES OR OBJECTS – These objects should be small enough to fit in the middle of the cup. We trimmed a few small plastic toys to make them fit. Small shells and found objects with interesting shapes work well. You can usually find tiny creatures at “dollar” stores. WATER and a container for pouring, e.g., a large container with a small pour spout or a large water bottle (or several bottles) with a spout that allows you to pour in small, controlled amounts, for example, approximately 2-3 tablespoons at a time. MODELING OR POTTERY CLAY – We’ve seen 5 pounds for $8 (Amaco brand). Play-dough doesn’t perform well because it swells, distorting the impression. Modeling or pottery clay is best and can be reused again and again. SMALL PAPER CUPS (Dixie® bath cups for example) – each child receives one empty cup and then another cup later, half-filled with dry plaster. POPSICLE STICKS or stirring sticks. One for each child. The flattened clay ball should take up less than half the cup. Flatten the clay well before making the impression. Place the object upside down in the clay. DO NOT bury the object. Share with your friends. If there is a large group, one set can be passed around, reducing cost. If a fish, insect or reptile is too big for the small paper cup, consider trimming it. Add pieces to other objects to morph them into weird creatures. Using one of the paper cups to measure, gently add ½ cup of plaster on top of the impression. Add 2-3 tablespoons of water. The consistency should be like thick pancake batter. If too much water, add small amount of plaster QUICKLY! Stir the water and plaster together gently, making sure not to poke the impression below. Let it sit for a minimum of one hour or overnight (recommended). 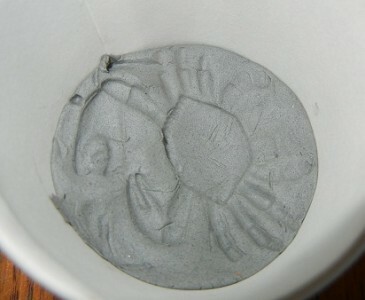 Tear open the cup over a trash can to reveal your amazing fossil. Reuse the ball of clay for another project. Keep in an airtight container. Use larger cups/containers to make bigger fossils. Remember, you will need more plaster and clay. Materials. One 4.5 box of Plaster of Paris will make 125 fossils (with a little extra left over). You’ll need a ball of clay for each student as well. It’s probably more economical to buy clay in bulk versus one small square of modeling clay. We tried using homemade play-dough and all the detail was lost in the fossil. Firmer clay works better. Count out cups and supplies needed for each child befor e the event. Make Mud for the Bottom of the Lake. Make a ball of clay (a bit smaller than a golf ball for each child. prepare a few extra to be safe. Store the balls in an airtight container. These balls will be pushed inside the small cups to simulate ground and silt. Test one ball to see how big you should make them. The ball should take up a little less than half the cup. Prepare the Lake Bed. Count out a set of cups equal to the number of fossils you will create. These cups will be given to the students along with a stirring stick and a ball of clay. Research and Create Exhibits. This is a learning opportunity for the kids. Do some research on local fossils, time-lines and examples. Prepare posters, small exhibits or lessons. Keep it short so the kids don’t get overwhelmed. BEGINNING OF EVENT – Let’s Learn! Educate the kids about fossils before they make their own. The first 3-4 minutes of the event should be captivating and peak everyone’s interest. Show them real fossils is possible. We brought in real fish, trilobite, ammonites and plant fossils plus a petrified dino bone! Each child had a real trilobite fossil on their desk to touch. Excite the students by keeping examples close to home. With a little research beforehand, you may discover treasures excavated near your school, town or city. 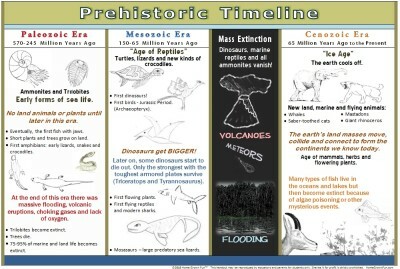 We also showed three posters with pictures of creatures that lived during three important eras: Paleozoic, Mesozoic and Cenozoic. Go to our DIGITAL LIBRARY to download the handout. It is just 99 cents and all proceeds go to educational programs we run for elementary students! 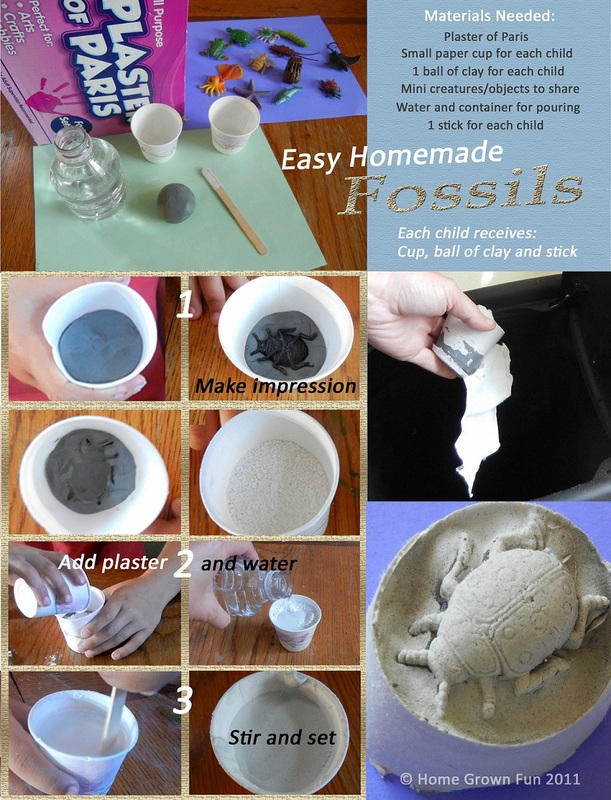 GROUP ACTIVITY – Create Fossils! Make Fossils! For a class of 25 students, fossil making takes about 20 minutes from start through labeling and cleanup. Finally, when it’s time to make the fossils, place one small cup in front of every child. Write the child’s name or ID on each cup. Add Clay Silt to the Cup. Plop a ball of clay in each cup or hand over a clay ball to each student. Instruct the children to carefully flatten the clay with their thumbs. Explain how this resembles silt, dirt or ground that the creature will lay in. Make Impressions. Provide the children a selection of miniature objects. Each child selects one object and presses it into their clay cup, making sure the detail is FACE DOWN in the clay. Do not bury the object. It needs to be removed. (To minimize cost, transfer the objects from table to table once the impressions are made. You will only need one set of objects.) Remove the objects leaving the impression in the clay. Make sure some detail shows when the object is removed. If an impression is not satisfactory, smooth out the clay and do again. Add the Plaster. Add 1/2 paper cup of DRY plaster into each child’s cup on top of the impression. Carefully Stir. Once water is applied, each child immediately and gently stirs the wet mixture with a stick. Instruct the kids to stir very gently but to make sure the powder is mixed with the water. If it is too thick, add just a bit more water QUICKLY before it sets. Store in a dry place away from activity for 24 hours. They may be ready earlier but it’s safer to wait. Reveal. The following day, help the kids to carefully tear open their cups (over a garbage can or container) to reveal a neat fossil. They will smile. Restore. If any crumble because the mixture was too wet, remake. Out of 125, we only replaced 4 due to the plaster being too wet to start or the impression not being made well and the child was not as excited. Paint the fossils. This is as much fun as making them. Kids can’t get enough of this craft. They’ll want to make more! Make your own organic fertilizers from materials you find around the house! Get our popular eBook with over 50 recipes, 140 images and close to 200 pages. It consistently rates in the top five of ALL Western Region Gardening and Horticulture Kindle Books on AMAZON! Find out how to mix up homemade nutrients and soil amendments for specific vegetables and fruit! Learn more about manures, sewage sludge and other ingredients you want to stay away from. Don’t use the wrong fertilizer ever again. We sell it on Amazon and also offer it as a convenient download in .PDF format from this website. Click on the image to learn more about the eBook or add the .PDF version to your shopping cart now. The transaction for the download is handled by PayPal and you’ll receive an email with the download link. EASY! All proceeds go directly to educational programs at public schools! What brand of modeling clay did you use? Was it modeling clay or pottery clay? I bought some air dry crayola clay and that did not work for me! Hi, I’ve used air dry clay before and got good results. However, my favorite clay is pottery clay, the generic gray kind you would use to make basic clay dishware or the stuff you would throw on a wheel. This clay usually gets fired in a kiln. It will stay soft if kept in a plastic bag with some moisture. The clay I prefer will also hold up for multiple sessions if you put it bag in a bag so it doesn’t dry out. I’m surprised the air dry didn’t work. How long did you wait until you took away the paper cup (mold)? Sculpey or Primo clay would work too. They come in smaller blacks and might be more cost effective than a large block of pottery clay. You might want to cook those clays for 15 minutes in a 225 degree oven to strengthen. Hope this helps. The price for pottery clay can vary widely. I saw 5 pounds for $18 at Walmart and compared to air dry at $9 I can see why air dry would be preferred. Hope this helps. Do you have a really good recipe for making one’s own amber? means to create something like this upabout my personal internet site and you have provided me a thought. I HAVE BEEN LOOKING TO FIND A WHOLESALE SUPPLIER THAT SELLS HYDROCAL, PLASTER OF PARIS IN BULK, ALL METALIC POWDERS TO MIX WITH THE ABOVE, I MAKE SMALL FIGURINES AND NEED THE ABOVE TO POUR IN MY MOLDS. IF YOU CAN HELP ME FIND A SUPPLIER IN SAN DIEGO OR NEARBY I WOULD APPRECIATE IT VERY MUCH. 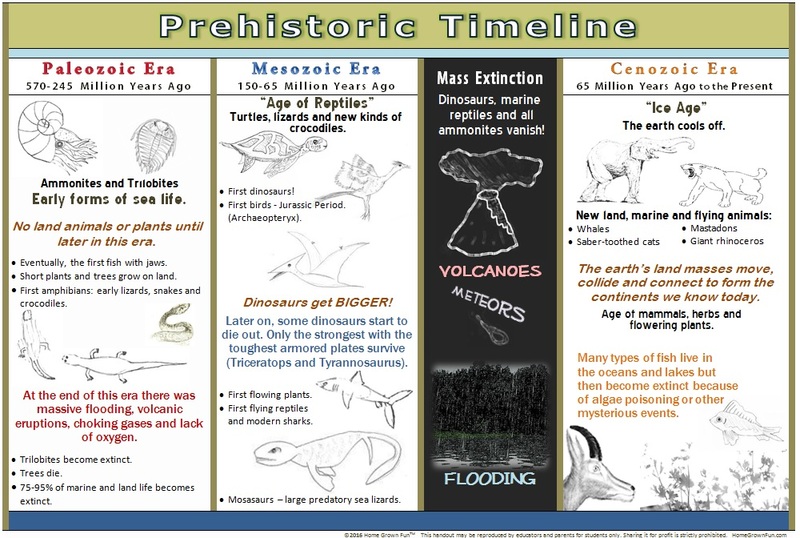 May take some shots of my homemade posters and add those here so you can see how we simplified the timeline for 2nd graders. Just found you and I Love Home Grown Fun! I am thinking of making fossils with my group of Kindergarten/First Graders. Looks like a very doable project. I would love to see the photos of the simplified timeline posters. Thanks for your great site. Hi Jo-Anne! It was awesome to get your comment – thank you. I am looking for a digital image of the poster I put together. I’ll post or send you a copy. You could print out individual copies for each child or create posters. I went the poster route and hand-colored just a portion of the black and white posters to save money. Added the timeline to the post. To simplify even more, replacing the images with whimsical cartoons and adding othet humor might make some of it stick. It looks a little dry but it made for a simple, low cost teaching aid. I had individual posters of each era (extra large) made in black and white to save money. If I had unlimited resources and time to prepare, I would have added sound effects and color. While we made fossils, I explained how the clay is like the lake bed and the plaster is like sand/silt covering the deceased animal. They got it.